Big Dogs or Small Dogs? I just really happen to love Big Dogs personally because their is more to hug with them and they're very fun to play fetch with. Small Dog's are nice for picking up and sitting on your lap but I love the breeds for big dogs. I love German Shepards ,Border Collies , Huskies , Golden Retrievers and Labs. ● "Big Dogs or Small Dogs"
[Gllnt] habitually points out that people have NOT asked a question. In THIS case he is correct. You have been in Y!A for 10 busy months and posted 225 Qs&As (wow - that's almost 1 a day! ), so should KNOW that the first field is for ASKING your MAIN Question, And that Y!A is programmed to place a ? at the end unless you do - it ISN'T programmed to work out whether the last word actually ENDS a question. 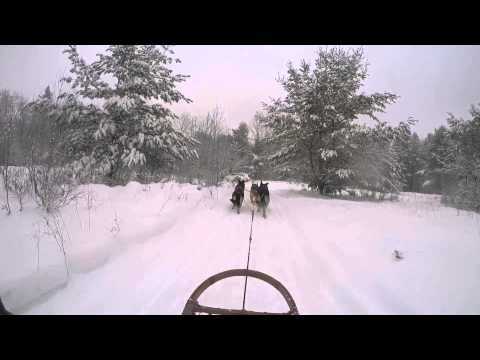 1● "Are big dogs or small dogs better for hauling sleds?" 2● "Are big dogs or small dogs better for herding sheep?" 3● "Are big dogs or small dogs better for protecting your family or livestock?" 4● "Are big dogs or small dogs cuddlier?" 5● "Are big dogs or small dogs easier to train?" 6● "Are big dogs or small dogs more intelligent?" 7● "Are big dogs or small dogs more suitable for living in an apartment?" - - - or something else. You should also have paid much better attention to your teachers as to the few occasions when it is RIGHT to start a word with a capital letter. 🤴🏽1: Neither - MEDIUM or slightly-above-medium sized dogs are best for this, as seen by the size of Alaskan Huskies, Alaskan Malamutes, German Shepherd Dogs ( https://www.youtube.com/watch?v=dkcK0Snu... could do with more SNOW! https://www.youtube.com/watch?v=O6il2DUZ... has plenty) and Siberian Huskies. 🤴🏽2: Neither - MEDIUM sized dogs are best for this, as seen by the size of Australian Kelpies, Belgian Shepherd Dogs, Border Collies, German Shepherd Dogs, etc. The exception is the not-meant-to-be-just-a-pet Shetland Sheepdog - but IT was developed because the Shetland Islanders couldn't grow enough grass to feed normal-sized sheep so developed a very small breed of sheep. And as their sheepdogs needed meat, they developed a small dog that wouldn't need as much mutton as GSD etc. It appears to have been mainly a Spitz (think Pomeranians) and various Collies, ;possibly with some small Spaniels as well. 🤴🏽3: The LARGE breeds (such as the original Irish Wolfhounds) are best against wolf-sized predators. But against humans and other predators the MEDIUM sized breeds are more agile and faster. 🤴🏽4: I doubt SIZE has much to do with it, but LONG-COATED breeds are probably what you'd like. My sister started with Rough Collies, had a Shetland Sheepdog between marriages, and ended up with Pomeranians. 🤴🏽5: In most cases the MEDIUM-sized "working" breeds are easiest (and HARDEST, when owned by idiots!). Border Collies, Standard Poodles, German Shepherd Dogs, Golden Retrievers, Dobermanns, Shetland Sheepdogs, Labrador Retrievers are rated as the 7 most intelligent & quickest-to-learn breeds - apart from the Dobermanns, they are either herding dogs or retrieving dogs. I remember a Labrador in my class in 1959 - 100% obedient while ere owner held the many-yards long sash-cord attached to her leash... But as soon as the owner got confident and allowed the cord to quietly slide to the ground the Lab was up and away for a lap of the racecourse where we trained in the car park. She was instantly followed by a Dobe who was never going to be first to break a Stay - but nor was he going to be third! The racehorses out on the track being trained were as unhappy as the jockeys at seeing these 2 largish black beasts trotting towards them. The club lost the use of the race-course. https://en.wikipedia.org/wiki/The_Intell... lists the 138 most-often-thought-of breeds for intelligence & trainability. 🤴🏽7: Frankly, very few dogs are SUITED to living in apartments. Dogs need a back-door that opens straight into a securely fenced back yard. But on the basis of taking up less space, the Toy breeds are nearest to being "suitable". If none of my guesses are what you had in mind, please click the [Edit] under your "question", then the [Add Update] that will pop up, followed by typing your CAREFULLY THOUGHT OUT real question into the empty field that will then appear, and that will attach itself to your "question" once you click [Save] or [Submit]. ● "I just really happen to love Big Dogs personally because their is more to hug with them"
YOU are heading for a nasty bite in the face! Very few dogs actually LIKE being hugged, although some will tolerate hugs from people they LIKE. The PAT-dogs (Pets As Therapy) dogs that visit children in hospitals and people in old-folks homes have been extensively trained & tested to tolerate being hugged and squealed at. Although you claim to be old enough to smoke Canadian cannabis, you give me the impression of being a precocious pre-teen. ● "and they're very fun to play fetch with. Small Dog's are nice for picking up and sitting on your lap but I love the breeds for big dogs. I love German Shepards ,Border Collies , Huskies , Golden Retrievers and Labs." "Shepards" don't exist - "my" breed's name is Deutsche Schäferhund, which translates as German Shepherd Dog. Both the first 2 breeds in your list are HERDing dogs, the last 3 are retrieving dogs - which leaves only the "Husky" (Alaskan Malamute? Samoyed? Siberian Husky?) - all 5-to-8 definitely "working" breeds. Because Y!A is so stingy that it activates only 3 web-addresses, you'll need to copy-&-paste the remaining addresses into your browser's web-address field. The people in them KNOW about GSDs. Plus you can include several actual photos in your posts. I prefer small to medium (about 15-40 lbs). "Big Dogs or Small Dogs?" Yes, there are some, there are also medium dogs. Did you have a question? Failure to ask a question is a reportable violation of YA guidelines. Shepherd is the correct spelling, however ranting about your preferences, is also a reportable violation of YA guidelines. And honestly I don't give a rat's a** as to your preferences. Prefer big dogs and German shepherds are my fave breed. Smaller breeds are generally known for living longer, can usually cost less to feed and vet, are easier to transport, and if you rent you're more likely to find a place that's more willing to take you on. Plus there's just so much personality in their little bodies. I have an almost 12 year old little canine bud who still isn't showing signs of slowing down which is just great. She loves her exercise , to explore and use her nose, and a game of fetch or a training session is never passed up. Just over an acre of land seems to suit my medium sized dog, 55 lbs. Who does cuddle in my lap every night. Small dogs. Some small breeds can outlast a big dog 2x over. Boxers are the one true canine master race. All others, large or small, pale in the face of Boxer glory. there are pros and cons to each. i've raised and watched all sizes of dogs.